This is a review and detailed measurements of the Schiit Saga passive/tube pre-amplifier. It is on kind loan from a member who has waiting literally months for his review! The Saga costs USD $349 from Schiit direct with stock tube plus shipping. The tube supplied with this unit was the Russian 68HC which is their clone of 6N8S (dural triode). For reasons too embarrassing to explain, I had to open the unit and there, I noticed the analog volume control (which gets converted to digital), had a nice notch on it. I was happy they were using such as that would avoid the volume control becoming loose, only to realize the set screw goes on the round part of the shaft, not flat! Anyway, back to the switches, the are microprocessor controlled and feel nice. Click the input one on the left and you rotate between five different RCA inputs. The switch on the right decides whether the Saga is a simple pass-through with volume control, or through an active hybrid tube+solid state output stage pre-amplifier. The gain in both cases is zero meaning whatever voltage you put in, is what you get out. 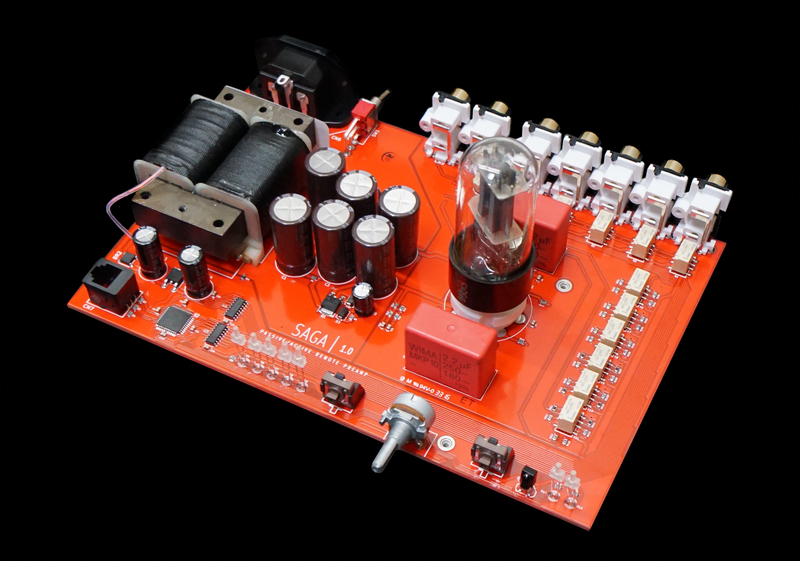 The volume control is a stepped attenuator using a handful of relays and resistors. Similar set of relays are used to select the right input. Let's get into measurements and see how each mode performs. As you see, performance is very stable. There is a very slight improvement in one channel up to about a minute but after that, there is no difference even at this magnification. This is a good thing as you don't want to age the tubes any more than you have to. I am usually full of complaints about myths audiophiles believe it. In this case, the above busted one of my own myths that tube products require significant warm up to get to stable performance. @SIY had told me otherwise but of course, I did not listen. We see the tiniest amount of distortion at 2 kHz (level at -150 dB) and mains noise (level at -145 dB). There is some noise around our main signal skirt. I can get rid of that by using the digital (DAC) mode of the APx555 generator but then distortion increases. Anyway, we have a SINAD of 122 dB at this 2 volt output. There is some mains leakage that may be due to ground loop or leakage of the power supply for the active stage in Saga. Either way, this is exemplary performance with just 2 to 3 dB of loss compared to APx555. Wow, this is very respectable! I have measured Schiit DACs with far lower performance. The offending distortion is the second harmonic at nearly -98 dB which sets the SINAD/THD+N. There are also power supply related spikes but they are at -108 dB and lower so don't come into play. Overall, this is one good showing so far! The pass-through mode (in blue) is ruler flat, reflecting the superlative performance of the APx555. I ran the active stage two ways: 1) with standard 100k Ohm input impedance of the analyzer (green) and 2) 600 Ohm load of the analyzer. We see that there is some droop with 100k Ohm load starting at 50 Hz and increasing to 2 dB at 10 Hz. This indicates a capacitor output stage which would naturally have increasingly higher impedance as frequencies decrease. Switching to 600 Ohm load emphasizes this and magnifies the problem substantially and artificially, giving us 16 dB of droop by 20 Hz. Looking all the way to the right, the minimum impedance is 183 ohm. At the lower end of 20 Hz, impedance climbs to 3,130 ohm. Using the typical 10:1 rule, your power amplifier input impedance should be at least 30k Ohm to avoid frequency dependent/EQ changes. Put more simply, if you use lower input impedance power amplifier after Saga in active mode, your low frequencies below 500 Hz or so will attenuate. This may accentuate the rest of the spectrum you may like, or not. The cursor is at 144 Hz showing an impedance of 2,760 ohm. This is in contrast to just 21 ohm impedance at max volume reflecting the 20 ohm output impedance of the APx555 analyzer. So essentially, any volume level less than 50% is going to increase the impedance substantially. Fortunately the attenuation is not frequency dependent so the impact is not there as there is with tube stage. However if the input impedance of the power amp changes with frequency and is less than 30k Ohm, then turning down the volume may change the frequency response. Perfection in distortion and noise has this price. I must say, I developed a fondness for this little pre-amp. I have no idea why as I would never use it myself. It just seems like a neat combination of features in a pretty low cost package. If you are looking for its features and are mindful of drawbacks with respect to its varying output impedance, then I don't see a reason to not get and play with it. You could use it as a nicely implemented audio switcher for example with the volume control for fine tuning of max level. Many thanks for the AP loop meassurement! Very nice. Did you notice any grounding issues like other Schiit products have had? Niceeeeee! I have one so it’s great to know it measures well. Thanks! Afaik the tube runs as a cathode follower in the Saga, which likely explains good results. As there's no coloration it's not all clear why the tube was chosen apart from the "coolness" factor. Glad to see this did well. I have always wondered why there are not more devices like this. What are people do for volume control when they are using separate amps? You might also run into this problem when using powered speakers with a source that doesn't have volume control. Another nice thing about the Saga is that it comes with a remote control. Thanks for the detailed review; this looks like a decent preamp. Given the brutal comments on some other Schiit products, nobody should accuse you of bias in the Saga review. You know computers, I know tubes. Thanks for this, very interesting. And re one of the comments above, having a tube configured as a cathode follower can be helpful (lots of feedback), but there have been a LOT of bad implementations. Nice to see these guys got it right. My question is why do you need the tube at all in this application as it doesn't add anything compared to an analogous solid state solution. Nice to see some good Schiit after all. Strange they can make such a good product and fail so miserably on others. Need has nothing to do with it. What it adds is coolness, if that's your thing (it is for me, which is why I design and build tube stuff). Sonic advantages? Nah. At best, a circuit will sound no different than an equivalent solid state circuit. I have been using a Saga between my DAC and tube amp for months now and while passive mode sounds just fine I find that switching the tube buffer on widens and deepens the soundstage and improves imaging and air. The stock tube supplied is just OK and the Saga scales with a better 6SN7GT. 1950 to 1953 Sylvania 6SN7GTs work well and you can find them for $50 to $70. I think the Saga is great value, even has a remote control, and sounds better than $1000 - $1200 preamps I compared it to. @amirm thanks for the measurements on passive vs active mode no one else has taken the time to show how output impedance varies with attenuation. Nice work! With the tube they can sell it at a higher price -> more profit. And you stay amazed watching it, and your guys. Greater soundstage? You have worse SNR and the H2 is at -100 dB. There are not audible harmonics here. Ah, the tube distortion. You can emulate with soft. Maybe is the output impedance. If you have a poweramp with high input impedance, near to 50 kOhms, passive is the best option I think. Lower input impedance and passive preamp is not a good idea. Emia autoformer, The Truth preamp and Tortuga LDR3. I use mine in desktop setup as volume control for JBL 305. And it’s doing great job. Passive vs tube sounds just a tiny bit different but it detectable even blind. Maybe difference in volume. Actually it is really easy and fun switching mode with the remote. @amirm did you try it? Pretty cool little piece of kit. I wouldn't use a pre-amp really but its good to see that Schiit has a product that isn't terrible.